All in Dutch, but there are several of his recipes to be found on the site. I translated this recipe to English and you can find it below. 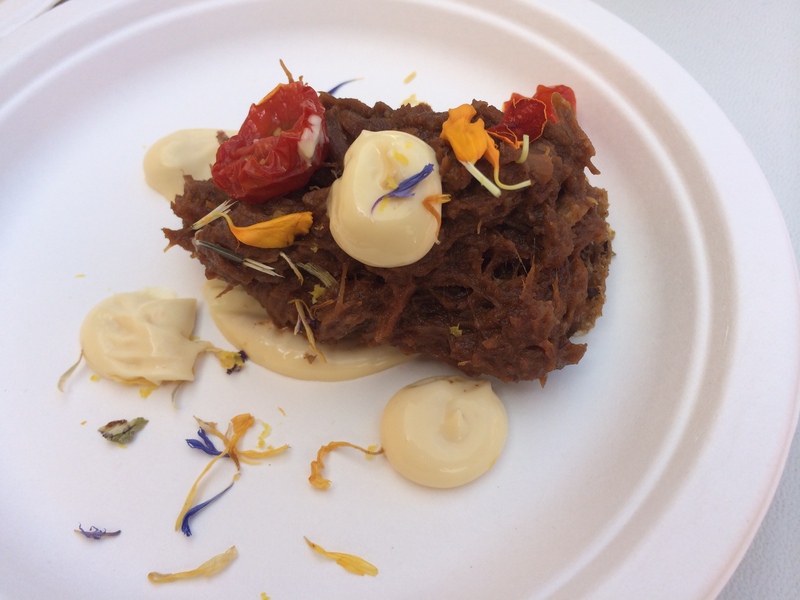 For last year’s Amstelveen Culinair festival, Aan de Poel served below crostini as finger food (if I recall correctly with braised spicy pork with semi dried tomatoes and roasted garlic mayo) and it was great. So when I found their recipe for a crostini with braised oxtail, I thought it would be a great option for the cookout’s main course for the carnivores. Furthermore, we thought it was a nice opportunity to add some molecular cooking elements, so we added balsamic vinegar pearls and garlic foam to this. It is an elaborate recipe although a lot of the components can be made while the oxtail is simmering for hours. Picking the meat of the bones is quite a hassle, but definitely worth it! The dish was delicious, with a nice crunch from the crostini and cauliflower and moist and intensely flavoured meat. The acidity of the balsamic vinegar pearls went well with the very rich gelatinous jus. The garlic foam gave a nice kick to the vegetables. The ingredient list on the site was missing 1 ingredient (carrot) and it was also missing some other ingredients if you look at the picture on the LXRY site. Besides the 10 minutes oven roasting there are no timings indicated, so a lot has to be done based on the (general) descriptions in the recipe. You will therefore have to depend on your own senses and culinary sensibility. Therefore, no suggested tweaks from my side, but I added some of my notes to the recipe below. We had some leftovers, so I reckon that you’d be able to serve up to 16 starters or 8 mains with this recipe. The molecular elements would easily accommodate these volumes too. Verdict: 8/10; Very nice, but quite a lot of work. Nevertheless, I will definitely be using the oven roasting and the stock for other cuts of braising meat. Add the majority of the jus to the meat to keep the oxtail moist and season if necessary (we did not need to). Save some of the jus for plating up. For the crostini: remove the crust from the slices of bread and cut in a nice shape (in the recipe they did a rectangle as it’s more like a starter size, so we just did a rectangle to be able pile up all the oxtail). Cook the crostini in a pan with a little oil until crispy (2-3 minutes each side). As garnish: braised turnip, braised cauliflower florets and sautéed mushrooms and serve with the jus (we also added boiled quail eggs, cress, balsamic vinegar pearls and garlic foam). Put the first 3 ingredients in a tall container and sprinkle in the soy lechitine. Mix it a couple of minutes with a stick blender until foamy and presto. Place a tall glass of vegetable oil in the freezer, allowing it to cool for at least 30 minutes. Heat balsamic vinegar and sprinkle in agar-agar. Stir until the agar-agar is completely dissolved. Using a pipette, drip droplets of the agar-agar preparation into the cold oil. Collect the pearls using a sieve and rinse the pearls with water. The trick is that the oil should be cold enough and the glass tall enough for the gelification process to be completed before the drops of the agar-agar solution reach the bottom of the glass. If the oil is too cold the droplets will float. Should this happen, keep dripping droplets of the hot preparation into the oil; the droplets will start sinking as the oil warms up. Shapeless or flat pearls indicate that the oil was not cold enough or that the glass used wasn’t deep enough.